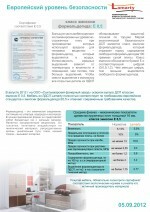 In August 2012 Ltd. Syktyvkar Plywood Mill launched production of chipboard with emission class Е 0,5. Furniture made of MFC Lamarty conforms to European standards on formaldehyde emission and meets modern quality requirements. Most part of furniture made of MFC contains formaldehyde - a harmful to man substance that is released to the atmosphere. Emission rate of formaldehyde depends on temperature and on indoor air humidity: the higher temperature, the more emission rate. To minimize emission rate all open details of MFC are faced with a protective film at the edges. Formaldehyde emission class, which reflects the norm of formaldehyde content in 100g of dry chipboard, determines the level of chipboard's ecological safety. Emission class is marked with the letter E and the corresponding number (0; 0,5; 1; 2). 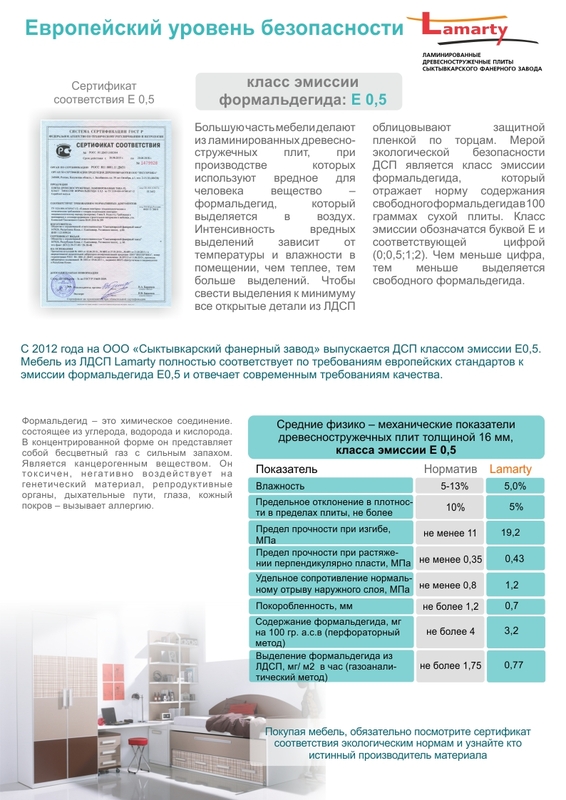 The lower emission class number, the less formaldehyde content. Formaldehyde which is a chemical compound of carbon, hydrogen and oxygen, is a colorless gas with the sharp odor in a concentrated form. It is a cancerogenic toxic substance which causes allergy, has a negative impact on genetic material, reproductive organs, respiratory tracts, eyes and skin.